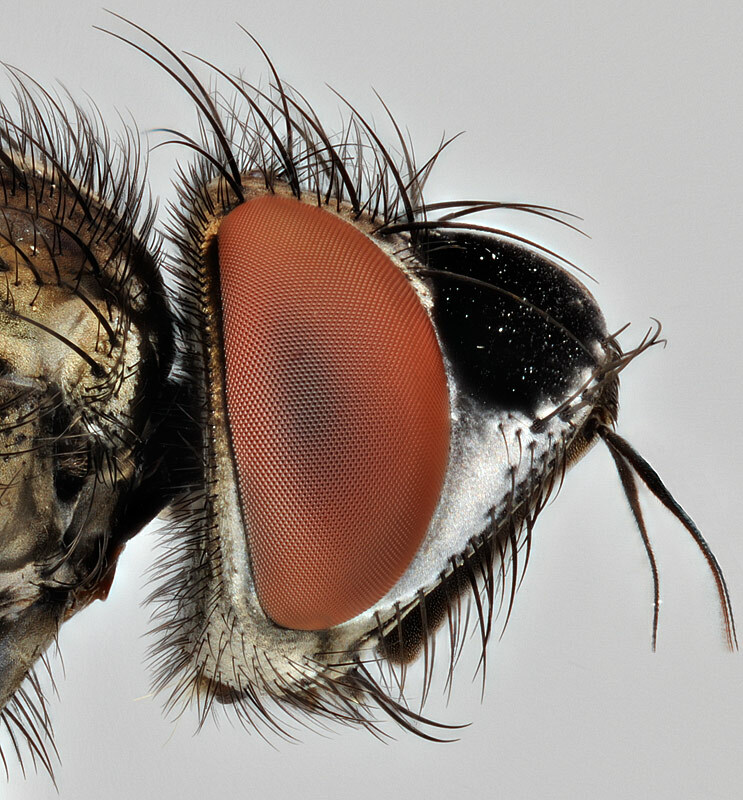 The width of this fly's face is 2.4mm. When seen head on (my face to the fly's face) I could see a bright silver dot from 10' away and that's what made me investigate. The area between the eyes being highly reflective silver - top image. However, when viewed from the side this highly reflective silver dome turns into black velvet but the lower part of the face remains reflective. (The arista on the right antenna moved between frames). 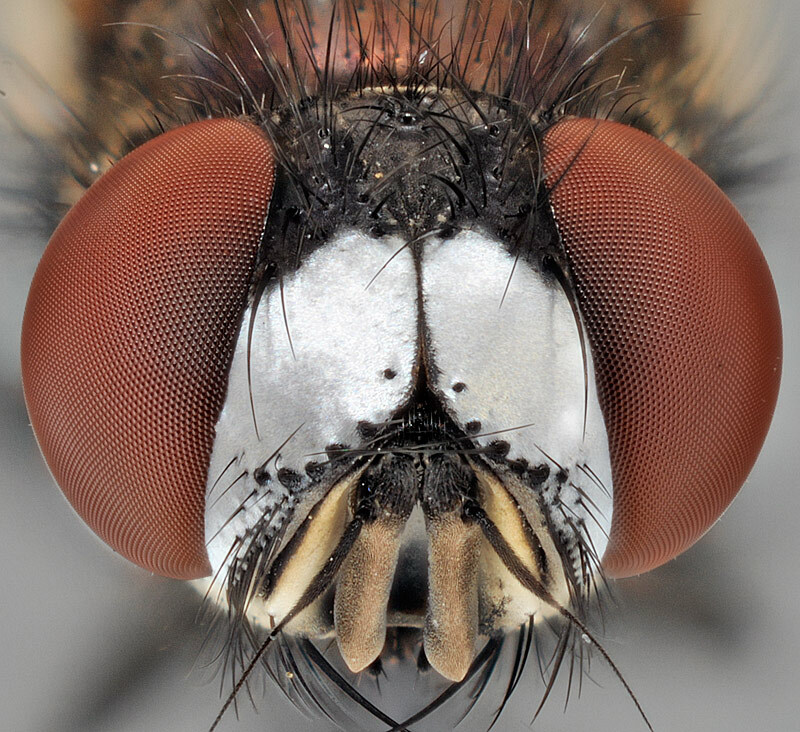 The fly is about 7mm long; and if it wasn't for its headlights it would never have been noticed. Now this I would like to see under an electron scope. Offhand I have no idea what structure would behave like this. Nice shots! I cant believe you could see the silver dot from that far away, very cool. Whats even cooler is its color changing properties from a different view point. Hats off! It was in one corner of my "tent trap" and I was checking the tabanids when I saw this 'bright light' in the far corner (the trap is 12' x 12' at the base). It looks white here but in real life it looks more like mercury or highly polished silver. Rik: structure is interesting but what about function? Anyway, I have the fly and if you can process it through your contacts I will send it to you. My guess is that they are fine relatively white hairs. When I cut my hair really short with clippers I see something similar except my skin and hair colour are wrong. From the side of the hairs (the front view of the flies head as they lay along the surface you see the sides of the hairs, from the right angle you see the black chitin substrate as you see the hairs end on. In my case you can just see my scalp when looking from the right direction. Great shots and interesting too. Looking at the profile shot I don't think I've ever seen a photo of a fly with a head that shape! Thanks guys. Let's hope Rik can get them under an Electron Microscope. Tried a dorsal shot agaimst a black background (such a background is not as easy to work with as my regular grey; Graham46 does a great job with his bugs). The projecting face positively glowed in the viewfinder. Well that looks almost retro reflective like 3M scotchlite material. But assuming it always looks bright from the front/top but not from the side I will stick with my original guess, looking forwards to the EM images. Just a more silly thought, retro reflective materials tend to use tiny balls which act as micro lenses, the underside is highly reflective and no matter which direction the light enters the balls it is focussed, reflected and re-collimated back in the same direction. I suppose instead of balls you could have rods or transparent hairs which are somehow highly reflective, this would also have a directional nature. I don't have regular access to an SEM, so it'll take a while for me to put something together. In the meantime, hang onto that fly. But the illustrations shown there give no hint that the beetle's appearance changes with viewing angle, as this fly's obviously does. Rik: That reminds me, interference effect as in Morpho wing scales ? Do you remember the relationship between your head, the fly, and wherever the light was coming from? If the light was right behind you, so your head was almost casting a shadow on the fly, that would argue for retroreflective. Seems likely, but that covers quite a wide range of effects. Your description of looking like mercury or silver suggests a mirror-like reflector that works equally well for all colors of light. In that case the "white" appearance in the photograph could just mean that it's reflecting your illumination diffuser. Could the "black velvet" appearance just be reflecting a big chunk of unlighted background? 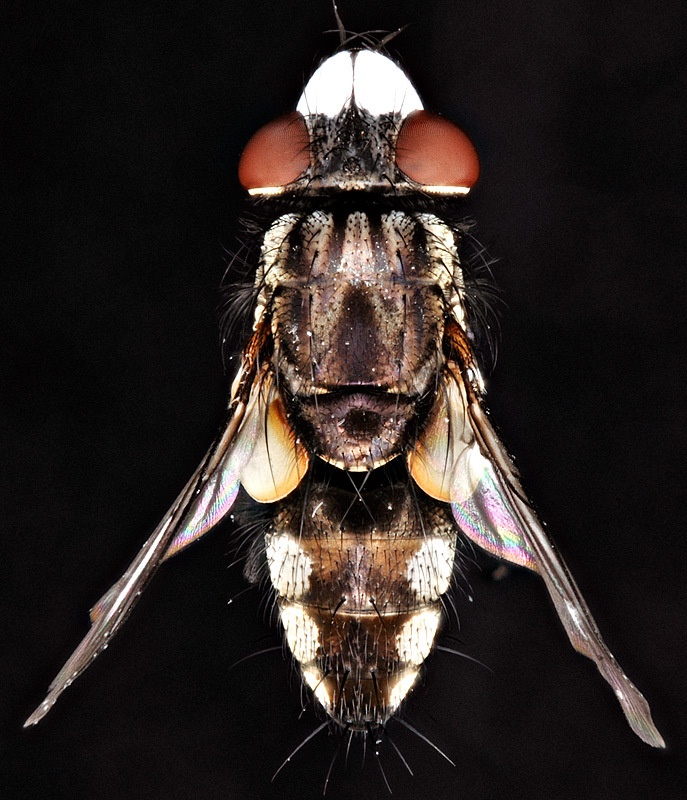 Your remarkable fly is Metopia argyrocephala, in the family Sarcophagidae (flesh flies). This species occurs in Europe and eastern North America and has been reared from the nests of bees and wasps, where their larvae live as external predators [images from a French site: http://www.galerie-insecte.org/galerie/metopia_argyrocephala.html]. Certain other kinds of sarcophagids have this same kind of remarkable face coloration (in Metopia, only the males have the silvery faces). Thanks Eric; would have sworn it was a tachinid. Your link has an extra ].